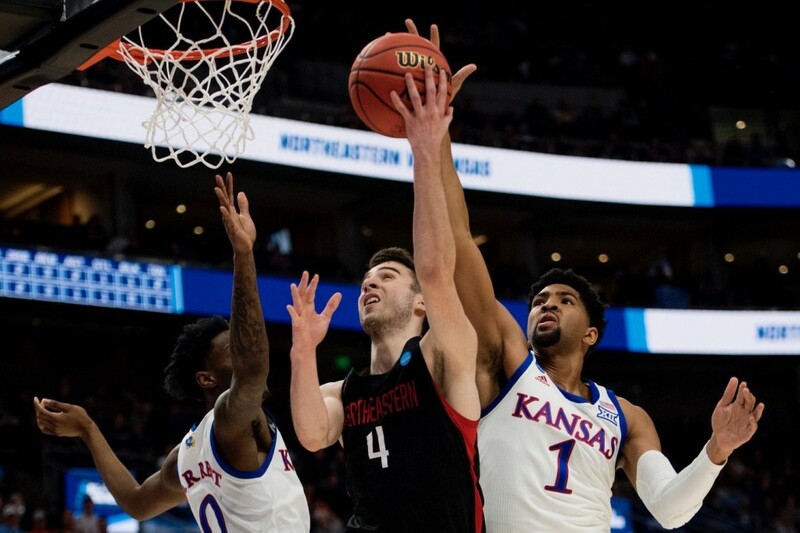 Dedric Lawson (1) and Kansas were too much for Northeastern on Thursday in Salt Lake City (Image Credit: GoNU). SALT LAKE CITY — It wasn’t the effort that Northeastern hoped for. The Huskies’ men’s basketball team made for a trendy upset pick prior to Thursday’s tip-off of the NCAA Tournament. Thanks to their experience, depth, and blistering three-point shooting, the 13-seeded Huskies looked like they might be a handful for 4-seed Kansas, which failed to win the Big 12 regular season title for the first time in 14 years. Sounds convincing on paper. On the court, the result couldn’t have been farther off. The Jayhawks (26-9) throttled the Huskies, 87-53, at Vivint SmartHome Arena on Thursday afternoon, in a First Round matchup in the Midwest Region. It was the Huskies’ largest defeat of the year, and the Jayhawks held Northeastern to season-lows from the floor (28% FG) and from three (21% 3PT). Kansas’ All-Big 12 First Team forward Dedrick Lawson dominated play, as the redshirt junior notched a game-high 25 points and 11 rebounds in just 27 minutes. The Jayhawks shot 56%. “If you’re dialing up the blueprint for an upset, you need to have a great shooting night. Unfortunately it didn’t happen,” said Northeastern head coach Bill Coen. Redshirt junior guard Jordan Roland led Northeastern (23-11) with 12 points, and redshirt senior guard Vasa Pusica added 7 points (2-13 FG) in his final game for the Huskies. Junior forward Bo Brace had 7 points, nine rebounds and four assists. “It’s so hard to get to this stage,” Coen said. Northeastern trailed, 37-25, at half. The Huskies scored the first five points of the second frame, thanks to a jumper from a Roland, and a free throw and dunk from senior center Anthony Green. Kansas’ lead was down to 37-30 with 17:06 remaining. It looked as if the Huskies would keep it close. The Jayhawks ripped off a 32-6 run over the next 11 minutes, putting the game out of reach. Lawson poured in 14 points during the stretch, splashing two triples and bullying his way to four layups inside. The Huskies had no answer, even with three defenders (Brace, Green and sophomore forward Tomas Murphy) each trying their hand at guarding Lawson. “We didn’t really have a matchup for [Lawson],” Coen said. Northeastern’s season-worst shooting percentage doomed them. The Kansas defense was locked in, but the Huskies missed some bunnies, and numerous threes rolled off the rim despite looking like makes. “One thing about Northeastern is it’s so important to take away shots off the catch and make them try to score off the bounce,” said Kansas coach Bill Self. Pusica had his second-lowest scoring output of the season. Self says the Jayhawks had a plan to suffocate the Huskies’ leading scorer (18 ppg). “Our whole game plan was to hard hedge him, make him feel us, change directions and certainly go over every ball screen,” Self said. Pusica, Green and forward Jeremy Miller played their final minutes for the Huskies on Thursday. Brace and Roland both had kind words for the trio of departing seniors. “Being with them for the three years that I was was a very special opportunity,” Brace said.